St. Patrick’s Day is nearly here, and while many will be headed to pubs with shamrocks pinned to their jackets to celebrate all things Irish, there is one contribution from Ireland that bears a toast (or two! ): the boycott. 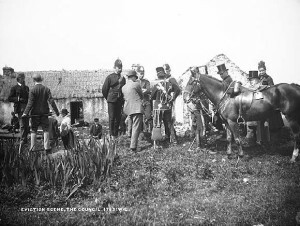 Coined in 1880 during the Irish Land Wars, the phrase refers to Captain Charles Boycott, a land agent for Lord Erne. It was a rough year, harvests had been poor, and the tenants had petitioned for a 25 percent rent reduction due to hardship. It had been refused. Boycott attempted to evict 11 tenant farmers. Outraged, the rest of the community began a social ostracism campaign, shunning the captain, refusing to help harvest his crops, and non-cooperating with his eviction efforts. Irish author George Moore reported: “Like a comet the verb ‘boycott’ appeared.” Within six weeks, newspapers as far away as New York City were using the term. There is hardly a nonviolent movement around the world, out of hundreds of case studies, that has not used some form of a boycott! Think of Gandhi’s spinning wheel and concurrent boycott of British cloth imports, the American Independence movement’s boycott of tea, the Montgomery Bus Boycott and the United Farm Workers’ Grape Boycott, the boycott of white-owned stores in South African townships during the anti-apartheid struggle: the examples are numerous. So, this St. Patrick’s Day, while you’re celebrating leprechauns, shamrocks and all things Irish, lift a glass and raise a toast to one of Ireland’s greatest contributions to a more just and equitable world: the boycott. Author/Activist Rivera Sun, syndicated by PeaceVoice, is the author of The Dandelion Insurrection and other books, and the co-founder of the Love-In-Action Network.